London South Bank University (LSBU) co-hosted a one-day event on embedding an enterprising curriculum within universities and colleges. The event was held in collaboration with Enterprise Educators UK (EEUK) and the Higher Education Entrepreneurship Group (HEEG) at LSBU's Clarence Centre for Enterprise and Innovation. The programme looked at different approaches to incorporating enterprise skills and experience into non-business related subject areas. Educators from a range of institutions presented examples of how they've developing an enterprising approach to their work, including LSBU Product Design lecturers Andrew Forkes and Barney Townsend. Andrew and Barney presented their Pop Up Shop project which forms part of the Design Thinking and Practice Module within the BSc (Hons) Product Design curriculum. In the three stage project, students design the branding and marketing strategy for a pop up market in groups. 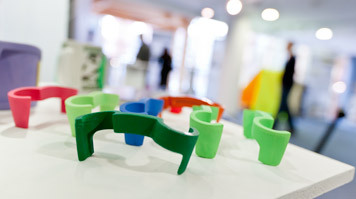 They also design individual products, which are produced in collaboration with 3D printing experts Digits 2 Widgets, and then sold at the market. "Enterprise education isn't about businesses. It's about getting students to think innovatively and to use their skills in a practical way. Hosting this event was a great chance for us to bring together this important network of educators, so we can share ideas and experiences to help equip our students with the tools and experiences to make things happen for themselves," said Linsey Cole, Head of Student Enterprise at LSBU. Along with keynote addresses by academics from the University of Leeds and Cardiff University, attendees got to network with other enterprise educators from across the UK and partook in a discussion chaired by Dr Martha Mador from Kingston University. "Embedding enterprise within the curriculum is an important topic for EEUK members. LSBU's Research, Enterprise and Innovation team worked with EEUK and HEEG to devise an excellent programme and feedback from delegates has shown that they found the day extremely useful.," said Kate Beresford, Heads of Memberships and Operations for EEUK.